Manchester United's new American goalkeeper Tim Howard admits he will be playing "fantasy" football after completing a £2.3m move to Old Trafford. 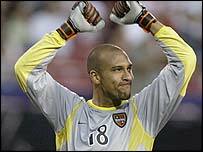 Howard signed a four-year contract after completing his move from New York New Jersey Metro Stars. Manchester United manager Sir Alex Ferguson has been tracking 24-year-old Howard for 12 months and insists he will rival Fabien Barthez as first choice. Howard said: "It is a fantasy to think I will play here, and when the interest came it was very humbling." He is looking forward to playing in United's American pre-season tour, saying: "The American fans will just eat this up. The players will be like rock stars out there. "It is an honour to come and play for the biggest club in the world." Ferguson said: "We've watched him and everything we have seen has been impressive. He has real presence." "Players work hard every day for the hope to have this kind of opportunity," said Howard. Howard will get his first taste of action for his new club on their United States tour. Manchester United incumbent Barthez will miss the pre-season trip after being given extra time off following his involvement in the Confederations Cup. "It's great for me," said Howard. "I just need to get better and work harder. "If I get to start some games, that's great. If I'm a reserve in some games, that's great. "I'm so happy. It's been a long time, and I feel so fortunate. Not many people get the opportunity that's been given to me. I feel blessed. "Obviously, the national team is a big issue and I need to be playing and getting better." Metro Stars assistant coach Mo Johnston told BBC Sport: "He's a wonderful goalkeeper, tremendously agile, and I'm sure he'll be a success in England." Howard has been in outstanding form in America's MLS this season and was overwhelmingly selected as goalkeeper for the end-of-season All-Star game. He polled more votes from the league's coaches than any other player. Howard suffers from Tourette Syndrome, a neurological disorder that causes nervous tics and uncontrolled verbal outbursts. But the goalkeeper insisted the condition did not effect his game. "Tourette's Syndrome is not a problem. It is part of my life," he told BBC GMR. "It doesn't affect me one way or another on or off the field. "It is unfortunate people are not as educated as they should be but that's the way of the world. "In the match it doesn't affect me. I need to keep the ball out of the net and it will never affect me doing that job. "Maybe there are times off the ball but even then it is not much of a problem." "Tourette's Syndrome isn't a problem in my play"
Who should start in goal for Man Utd next season?